First of all, we would like to wish all of our readers and customers a very happy Thanksgiving! As day to give thanks, we are thankful for our customers who are a source of continued support and the reason we keep growing and bringing more unique things to the Garden Center. We hope you have a wonderful day with family, friends and lots of wonderful food. While you are visiting the Garden Center to pick our your Christmas tree, make sure you stop in to the gift shop to see all our our holiday decor and gifts. We love to bring our customers a beautiful selection of unique items and the holiday season is a great time to do so. We have unique holiday planters, cemetery logs, ornaments, candles, angels, and of course gardening items. The gift shop is great place to find something for that hard-to-buy-for person on your list. When all else fails, you can always get them an Edward’s Garden Center gift certificate! Hope to see many of you visiting the Garden Center this holiday season and don’t forget about our Holiday Celebration December 5 & 6. More info on our website and in next week’s blog post. The countdown is on. There’s just one week until Thanksgiving. 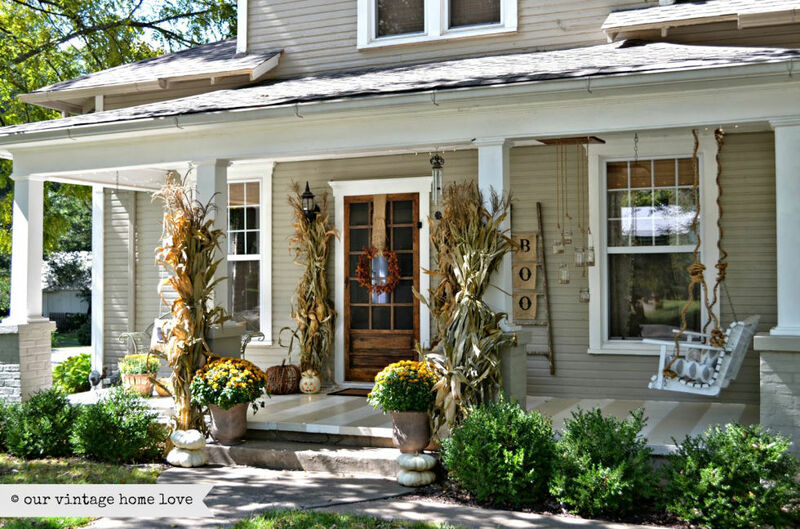 Is your home appropriately decorated? Maybe it is and you just want some fun projects to do with the kids or maybe it isn’t and you better get busy. To help you out, we have collected a few easy DIY decoration ideas that you can accomplish before the guests arrive at your home. Though it fells like the day is about turkey and pumpkin pie, the day is really about giving thanks. Create a message board and ask everyone who comes to your home to write what they are thankful for. You can create the frame from a piece of cork board cut to fit into a large picture frame. Use real leaves if you can still find them or cut them out of construction paper. Purchase a few votive candles and some textured paper. Wrap the lights, add a decorative bow and perhaps even a feather. You can get super creative with this one and it’s an easy project to complete. What could be more festive than a centerpiece made from a pumpkin? A pumpkin “basket” makes an imaginative centerpiece for a fall table. Hollow out the pumpkin, then place a block of wet floral foam inside. Position a pillar candle in the foam and surround with fall blooms and berries to complete this DIY fall decoration. Using items from your backyard you can create a beautiful centerpiece for your holiday gathering. Get a coffee can and glue sticks to it. You can add a burlap bow or ribbon to add some more rustic flair. Since the weather is getting cold, you may not find fresh flowers. If you don’t have any to use, you can get artificial flowers at the dollar store. Winter is coming….not just a famous quote from hit show and book series Game of Thrones, but also the truth! Cooler weather has descended upon Northeast PA and we know that means frigid temps will be here soon. Cold weather is not just a pain in the neck for us, but can be a hazard for our bird friends that don’t fly south for the winter. During the winter months, birds have a rough time finding fresh water. Many of the streams, ponds and bird baths that they are used to frequenting are frozen over or dried up. Water is not only important for hydration, but it also helps birds preen their feathers. Without proper preening, birds’ feathers won’t stay positioned and aligned. Feathers out of alignment in winter create gaps in insulation, which makes birds lose body heat faster. To help provide fresh water to birds over during the winter months, make sure your bird bath is always full and has a heating element to keep the water from freezing. You can purchase heating elements at hardware store or online. Many of these units turn on and off automatically depending on the temperature outside. Water is the most important thing you can provide for winter visitors, but food is a close second. 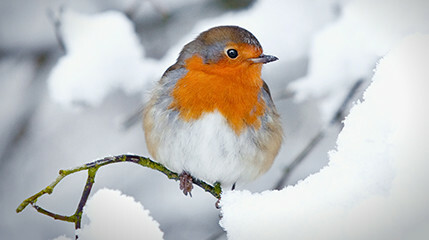 Birds bodies require more calories during winter months to keep them warm. Seeds, plants, berries and insects won’t be around for birds to feast on. Many birds look for reliable feeders during the harsh winter months. You can help by providing feeders with Suet, Nyjer thistle seed and black sunflower seed. The more often you keep the food stocked, the more often you will enjoy watching your feathery friends this winter. Birds do like to keep warm and out of the snow in the winter. While some birds grow extra feathers or drop their body temperature to stay warm, others needs a warm place to hide. Providing birds with a small house to rest will keep them happy and safe all winter long. You can help by leaving your bird houses outside in the winter and cleaning out all of the debris from the breeding season. We all enjoy watching the birds fly around our garden during the spring and summer, but don’t forget to care for them all year round. Providing fresh water, food and shelter will keep the birds coming back to your yard over and over again. Some information for this post came from http://www.drsfostersmith.com/pic/article.cfm?articleid=2060. Categories: Gardening Fun and Related Topics, Gardening Tips & Tricks, In Season: The latest gardening trends | Permalink. Generally by November 5 in Northeast PA, we are bringing in our flowers and thinking about how to winterize our gardens. This year we are lucky enough to enjoy a few more weeks of nice weather. 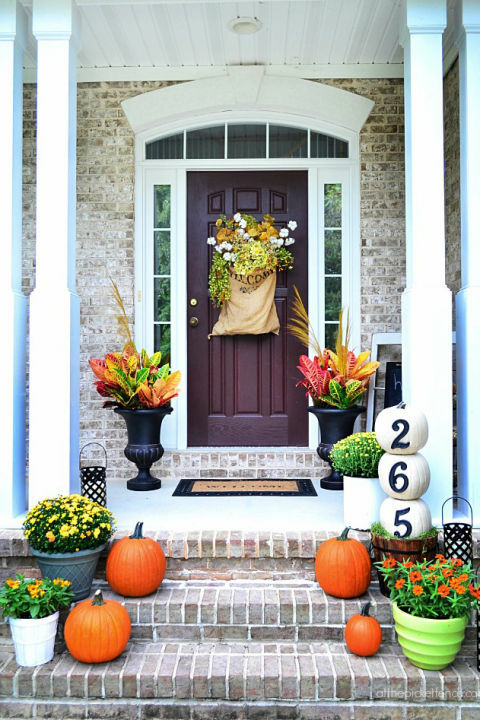 So let’s celebrate by making our porches and front entrances festive! Here are some of our favorite ideas for fall. Cute idea the kids can help you make! Paint a pumpkin white or purchase white pumpkins. Paint your house number on them or use felt or foam numbers. Plant your seasonal flowers in a rustic pail or pot. Repurpose whatever you find for a rustic look. 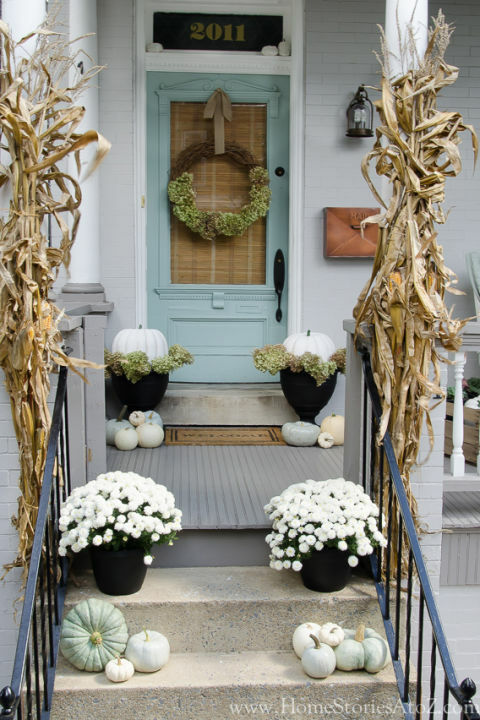 Fall is FULL of colors so make your porch or walk way calming with cool tones like white and pale blue. Large cornstalks are definitely eye catching as people walk or drive-by. 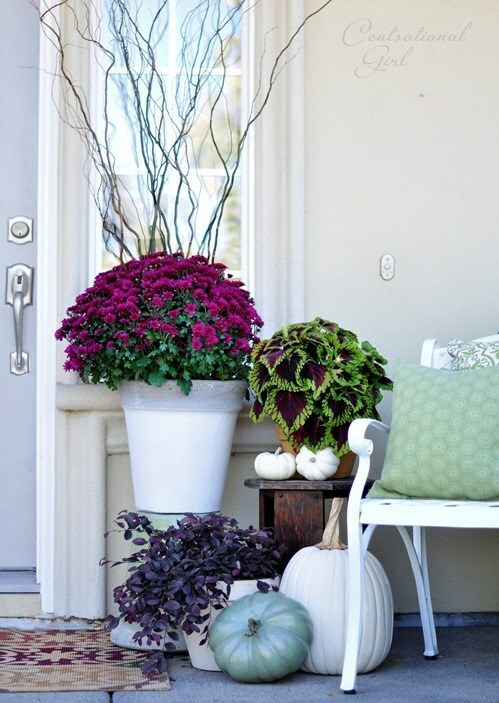 What could make your porch look more falltastic? Once thought of as strange, the white pumpkins are very popular for designing this year. You can create a pretty scene using jewel-tone flowers and monochromatic pumpkins for an elegant look. At Edward’s Garden Center we love to repurpose old things. In fact its one of Diane’s specialties. 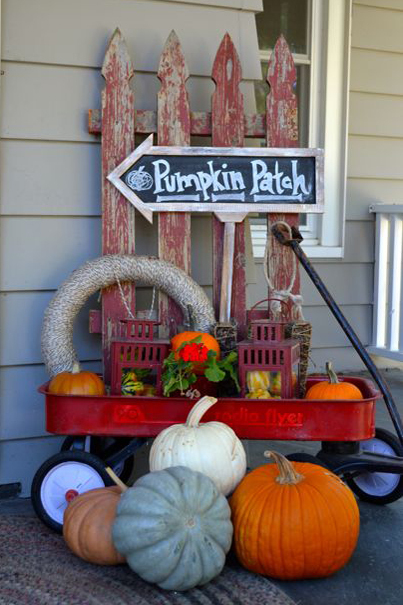 One of our favorite ideas is reusing an old wagon to create a pretty scene. 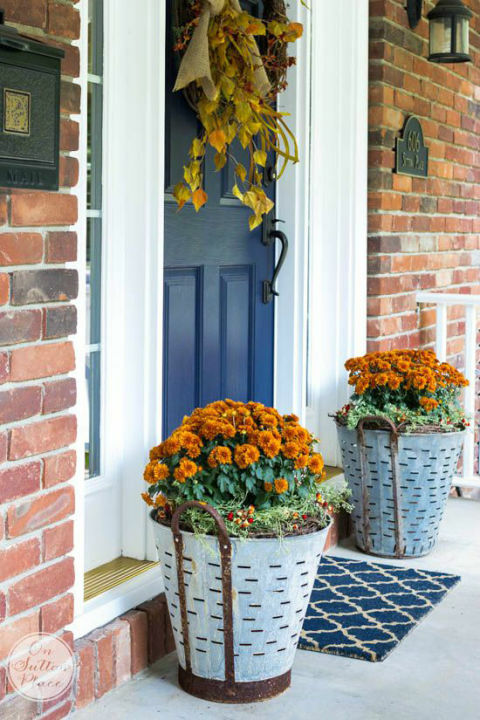 We hope you enjoyed seeing some of our favorite ideas for decorating your front porch. Enjoy the unusually warm weather and create a beautiful entry way into your house! Photos for this post came from Country Living and Buzzfeed. Categories: Gardening Fun and Related Topics, Gardening Tips & Tricks | Tags: decorating with pumpkins, Edward's Garden Center Forty Fort, fall decor ideas, fall decorating, fall front porch ideas | Permalink.